Indians are yet to come out of the Kondagattu Bus Tragedy which claimed over 60 lives. Another deadly Bus Accident took place within just few days. 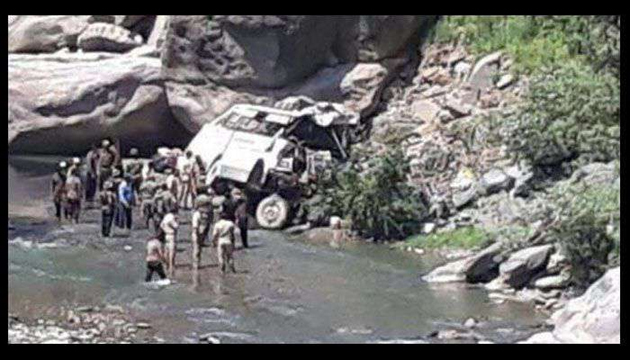 At least 13 Passengers of a Mini Bus were killed on Friday after it plunged into a 300-feet gorge in Kishtwar District of Jammu & Kashmir. The ill-fated Bus was on its way to Kishtwar from Keshwan Area. Upon skidding off the road, It fell into the deep gorge near the Chenab river. Around 30 Passengers are in the Mini Bus when the accident happened. 13 of them have been declared dead. Another 13 people suffered injuries. Officials have been planning to airlift eight passengers, who were critically injured, to Jammu. Rs 5 lakh ex-gratia was announced for the kin of the deceased. Rs 50,000 will be given to the injured passengers.